The Potomac and Rappahannock Transportation Commission is testing the 81-seat bus on a number of routes this month to determine whether double-decker buses should be part of its future plans for commuters along Interstates 95 and 66. The Potomac and Rappahannock Transportation Commission is testing the bus on a number of routes this month to determine whether double-decker buses should be part of its future plans for commuters along Interstate 95 and 66. Riders who end up on the 81-seat bus over the next two weeks or so will ride free in exchange for filling out a survey. “We’re really looking at different ways to get high volumes of commuters and throughput matters tremendously on I-95 and I-66, how can we get all those commuters through these key areas quickly and most cost-effectively,” said PRTC Executive Director Bob Schneider. OmniRide staff are completing final reviews this weekend of routes the bus will be tested on to ensure the bus can fit under bridges, make all the required turns and otherwise operate smoothly around the Pentagon, Metro stations and downtown D.C.’s lamp posts and trees. The bus includes a video monitor for the driver to see the upper level, which riders can also use before going upstairs to see if there are seats available. At 6 feet, 4 inches tall, Schneider said he does have to duck a little when standing on the upper level, but he would still be glad to add more seats if it means moving 90 people through an intersection or along the highway in such a condensed amount of space compared with cars or even carpools. 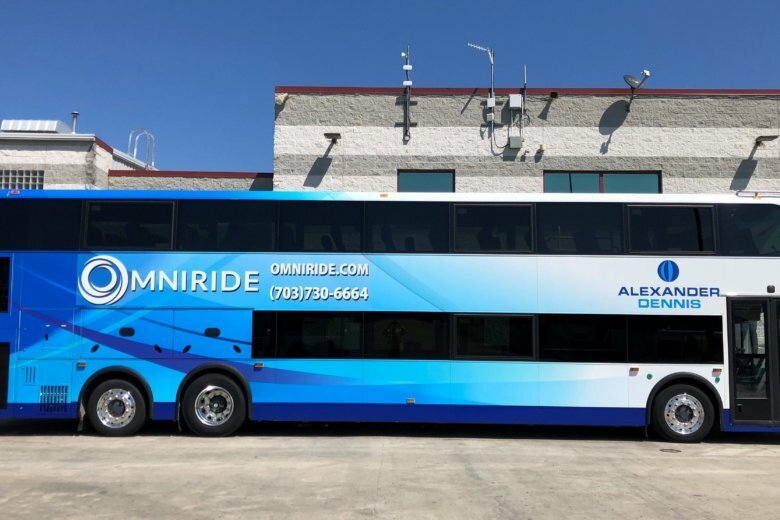 The double-decker bus — provided as a demo by the European manufacturer Alexander Dennis — has 24 more seats than most of OmniRide’s regular commuter buses. The double deckers cost about $1 million each, compared with about $600,000 for one of the typical coach buses. A goal would be to focus the double decker on routes that are already overflowing, because operating a single bus with a single driver as opposed to needing two buses and two drivers could save money in the long term and make the system eligible for certain federal grants. With toll lanes due to open on Interstate 66 by the end of 2022 and expansions of toll lanes along Interstate 95 and 395, commutes like Gainesville to the Pentagon could include even more bus riders. “That’s a massive market for us in terms of the number of residents that live out there,” Schneider said. In addition to operational questions about the new buses, PRTC would need to be satisfied it has the capacity to maintain the buses.